A world heritage site with colonial architecture, and surrounded by mountains and volcanoes, Antigua offers so much for travelers. There's no wonder it's one of the most popular destinations in the region. Hostels can be found around town with a variety of moods and social atmospheres. 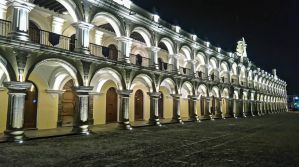 The hostels listed here are great for meeting others, as some are party hostels and some have a more chill-out and relaxing vibe. But all offer quality places to stay. Either way, make sure you know what you're looking for before you make a reservation. Also, free breakfasts, clean rooms, and rooftop terraces are standard with many hostels in Antigua. With two onsite bars as well as plenty of spots to relax with hammocks, bean bags, a central swimming pool, and other spots, this is the place to be to hang out and meet other travelers. They offer dorms and private rooms at affordable prices. The main bar is downstairs, while the rooftop terrace bar provides views of the city and the surrounding mountains in the distance. At night, this hostel comes alive and is very social with music and activity. A restaurant, lockers, laundry service, Wi-Fi, and other typical amenities are also available. Located in a great location in the middle of town, the Tropicana has an onsite bar and restaurant, and a small but nice swimming pool. In addition to that, they have a great rooftop terrace with views of the city and surrounding volcanoes. One of their unique specialties is that they offer a multi-day trek to the nearby mountains and volcanoes, which helps add to the social atmosphere as this is a great opportunity to make friends and then enjoy their company upon returning to the hostel for a few nights. Bunk bed dorms and private rooms are available, and reviewers state that the facilities are clean and comfortable. Staff is friendly and helpful, and the food provided by the restaurant is good. They also have a TV room with movies and games. Lockers, laundry, Wi-Fi, and other luxuries are also available. 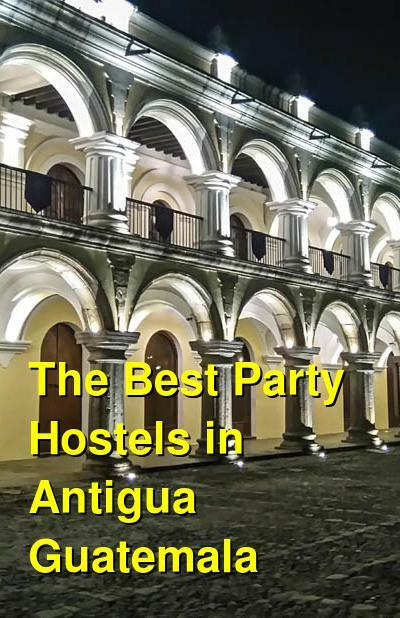 In the middle of town, the not-so-creatively-named Hostal Antigua has a cool vibe, plenty of clean dorm beds and private rooms, and a comfortable common room area for socializing. They also offer access to their sister property's pool and amenities for a small fee, which is a nice bonus for those that want to live it up for a few days while staying on budget. Their list of amenities is typical of most hostels: Wi-Fi, laundry, lockers, clean bathrooms, an outdoor terrace, tour booking and transportation options, a communal kitchen, and the list goes on. But above and beyond the amenities and the basic name is the great atmosphere created by the staff and the other guests looking to have a great time. A favorite among reviewers! The Casa Jacaranda offers dorms as well as private rooms with shared bathrooms. Free Salsa lessons several times each week at the onsite bar and restaurant help get the fun started. And the free breakfast (reviews claim it's terrific) brings everyone together in the morning to plan the day's adventures. Unwinding at the bar and common areas (TV room, back patio with hammocks) in the evenings make for a fun and social environment at this clean and friendly place. With a long list of amenities such as Wi-Fi, laundry, and more, guests won't be lacking any luxuries. On top of that, the staff is very helpful when it comes to arranging transportation or tours and excursions. It's also located right in the middle of town, close to shops and restaurants.